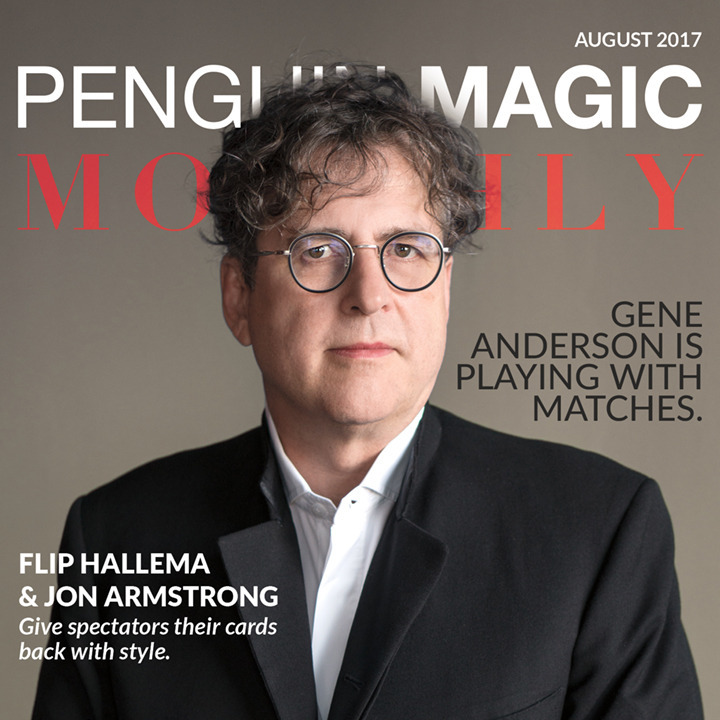 Today, when you order "Penguin Magic Monthly: August 2017", you'll instantly be emailed a Penguin Magic gift certificate. You can spend it on anything you like at Penguin, just like cash. Just complete your order as normal, and within seconds you'll get an email with your gift certificate. 01 John Carey: We Have a Winner! The August edition of Penguin Magic Monthly is not all plug and play. The issue offers simple non-card tricks coupled with card magic that requires more skill. So if you want to take advantage of some of the material, such as “Perfect Timing” or “The Gambler’s Cop”, you will have to go elsewhere to learn the basics. In addition, the bonus, “Instant Psychic Chewing Gum”, does not come with a trick. “We Have a Winner!” by John Carey is a reverse bank night prediction where the spectator is left with a winning business card after all others have been eliminated. This can be done impromptu and should work well with “Three Moments in Time” by Pablo Amira (June 2017). That trick is also extemporaneous and uses business cards. In fact, the outcome of the Carey trick could be used as a prediction for the Amira effect. “Clear Thought” by Mark Oberon is a simple, impromptu paperback book test. This can be done on the fly with a borrowed book. If you do card magic, you’ll recognize the method. As a bonus Mr Oberon tells you how to perform the reveal with a crystal ball. Are we clear? Crystal. 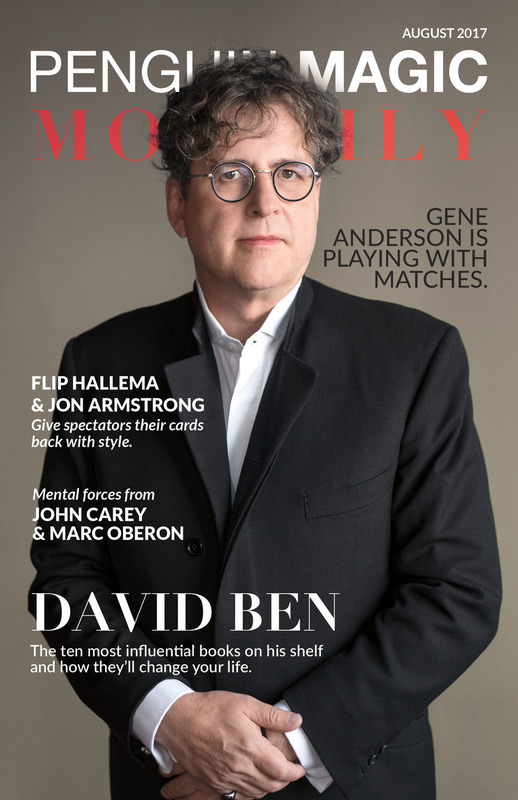 “All That’s Fit” is David Ben’s top 10 list of essential magic books. He includes an 11th bonus selection that is scheduled to be published later this year. “His Master’s Voice” by Flip Hallema explains how to shoot a chosen card out from a deck. I found the instructions difficult to follow. “Tips on Jordan” by Jon Armstrong allows you to produce a chosen card from a closed card box wrapped inside two rubber bands. The handling is not new but the trick has impact. “Perfect Timing” adds some fun to the classic “pick a card” line. A card jumps the gun and hops into the spectator’s lap. There’s no instructions on building the gimmick. However you can use Penguin’s “Tarbell 27: Rising Cards” or other references. “Cocktail Party” is a fun trick that uses common methods to make a wrapped coin vanish in a ball of fire and then reappear inside a lady’s purse. “The Gamblers Cop” explains several uses for this slight. It does not show you on how to do the Cop. “Count Back Like I Do” by John Carey is a simple two deck “Do as I Do” routine using the count-back card force. “Don’t Throw Garbage” by Hanson Chein is a gimmick-less restoration of a crushed plastic bottle. No air pump or CO2 cartridge, just an easy method. “Vanishing Match” by Gene Anderson shows you how to vanish a burning match in your hand. Ouch! The article includes a handling to use this as a closer. After performing this trick, why would you want to do anything else? “Card Clip” by Flip Hallema is a card-to-impossible-location that uses two slights and gimmick to make a signed card disappear from the deck and reappear clipped to a pen. “Instant Psychic Chewing Gum” is a nicely printed gum box that needs to be cut and glued together. Although some ideas are included for use, the box itself is not gimmicked – no flaps to slip a card into or special writing to reveal a prediction – so it’s pretty much up to your imagination to use or modify this. I thought this would just be a minor extra item with my shipment, but actually, it turned out to be very informative and I now use one of the effects in it within my act! 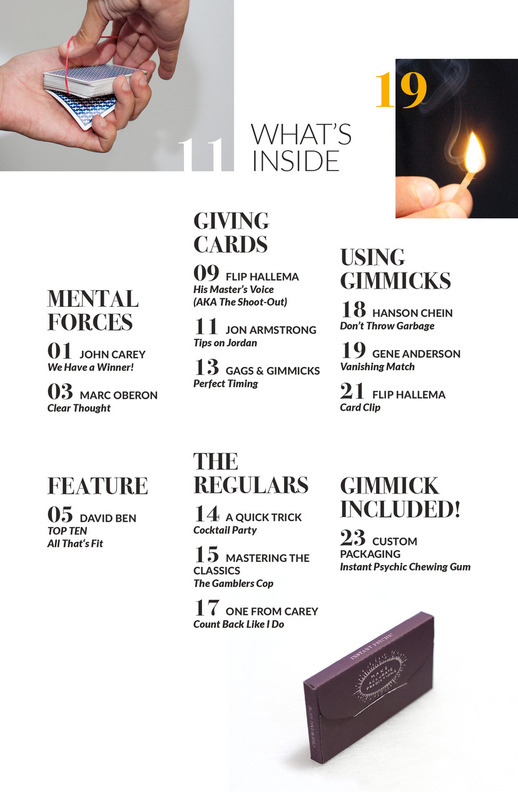 a really great little magazine ,well produced and some great magic , keep up the good work. I loved this copy of the magazine that I received with my order. The info, the tricks and gimmicks, the glossy presentation were the best. Great issue, as always; some cool moves that even an above-average, old-man giggling at himself in the mirror these days can put to use. However, of ALL the very cool "insert gimmicks" you've given us since October 2016...THIS is the best and I use it during EVERY "Think A Card or ACAAN" plot! I wish this little, monthly gem was around years ago when I started out! Great issue!!!! There is a lot of great magic, articles, and tips in this monthly publication. With the discontinuation of some other magic magazines, this is a welcome addition to the magic community. Well worth the price! Many good tricks and tips inside this issue ! I love "Tips on Jordan" and John CAREY routines (each month easy and good !) - THANKS for this great magazine. The nest of wallets is a very cool piece of magic and I will be keeping it in my pocket to perform at any time due to its simplicity and also it's amazing effect. My only problem is using this effect on its own dosent always get great reactions because its so quick.